PRODUCT: ChemLink Barr waterproofing membrane liquid, squeegee grade. High-performance solvent-free, low odor synthetic (non-asphalt) waterproofing. 2-gallon pail. Price/pail. DESCRIPTION: BARR is a cold applied, single component, waterproofing membrane that cures by exposure to atmospheric and substrate moisture to form a continuous, tough, reinforced elastic seal. 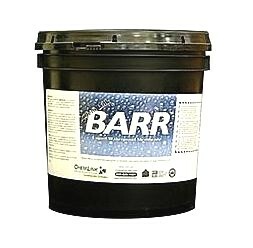 BARR is solvent free and compliant with all known environmental and OSHA requirements. It can be used in confined spaces without respiratory protection. BARR cures to an elastomeric rubber that is resistant to thermal shock. It will not crack in extreme cold or slump due to softening and high temperatures like conventional asphalt or coal tar based coatings often will. In above grade applications, use BARR to seal parapets, plaza decks, green roof systems and waterproof planter boxes. BARR is also a versatile general roofing repair product that can even be used to line and waterproof gutters. COMPATIBILITY: Barr will adhere to asphalt based surfaces, granulated shingles, wood, metal, masonry, EPDM roofing, glass, poyurethanes. LIMITATIONS: Not recommended for TPO, PVC Roofing, over silicone sealants, Kynar or siliconized paint metal roof surfaces. Not UV resistant. Requires topcoat in exposed applications. Barr is not intended to be a stand alone coating in exterior applications exposed to sun. Apply a coat of aluminum roof coating or alkyd resin paint to protect waterproof barrier from UV light and foot traffic. APPLICATION: Clean surface to remove dirt, loose product, surface contaminates, etc. Repair and reinforce cracks with reinforcement fabric and M1 sealant. Apply from pail and spread out with a squeegee, putty knife, trowel, roller or stiff brush. Application is in two coats. First coat is 30 mils thick. Allow to tack dry (about 40 minutes) then apply finish coat of 30 mils, in opposite direction. PHYSICAL PROPERTIES: see data sheet. Lucas 5500G Seam Sealer Pumpable (gun) Grade - 5 Gal. Lucas 5500M Rubberized Seam Sealer, Brushable Grade Mastic, White Color. An intermediate viscosity designed for manual application to seams and fasteners. 3-Gallon Pail. Price/Pail.